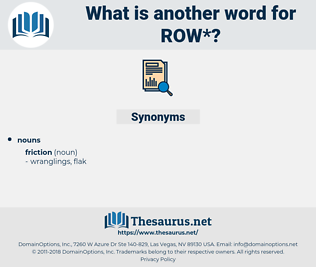 What is another word for row? quarrel, hallway, oar, condemned, bickering, wrangling, column, forefront, suite, brawl, pavilion. calmness, quiet, calm, silence, order, tranquility, harmony. give in, compliment, make peace, praise. Well, there was a row at home about my going so much to Hallijohn's. And I shall make him take me next row there is on. 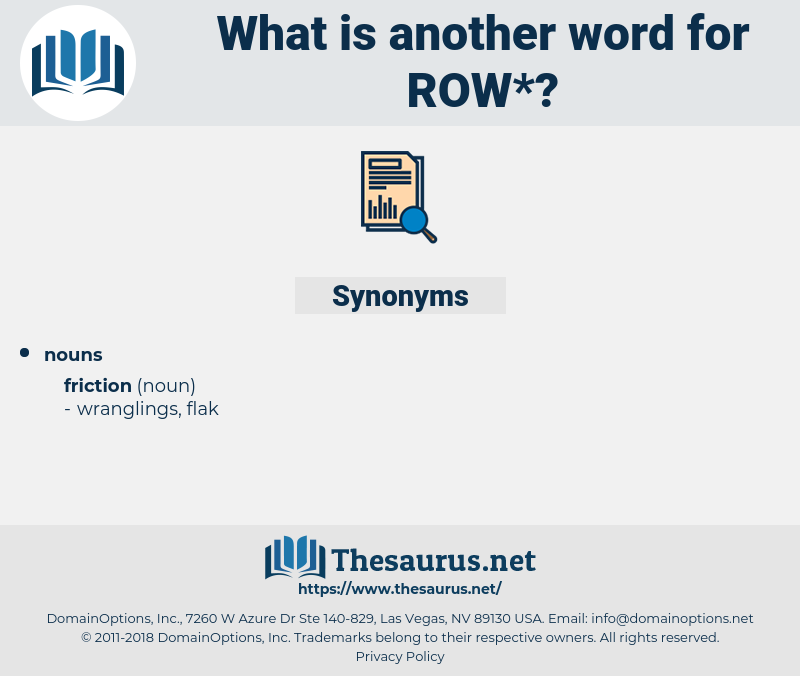 raw, rariora, rehear, rhea, Rowe, rio, rear, rya, rewa-rewa, Roi, ruhr, roar, rohe, rewire, ri, ru, rower, rue, roe, R-2, re, ray, Rheault, roue, ru 486, rare, ra, wroe, roarer, raiu, rahu, rye, rho, ro, R, RIRA, rh, ROH, reaux. row of bricks, damp-proof course, damp course. feather, scull, pull, stroke, square. chronological sequence, sequence, chronological succession, successiveness, succession.